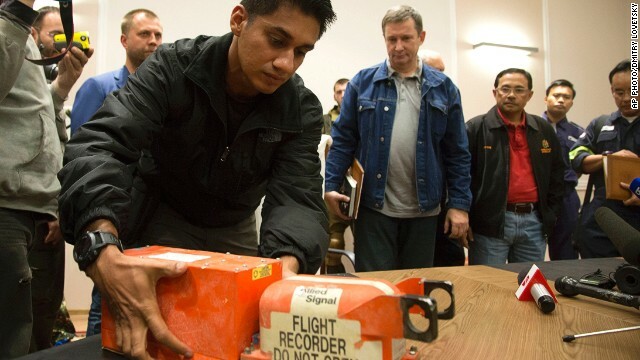 Answers still needed: Rebels gave Malaysian officials the data recorders from downed Flight 17 early today, days after the passenger jet was shot down in eastern Ukraine. It was a significant step forward in an investigation that's been stalled for days, but key questions remained unanswered: Will the black boxes give investigators the clues they need? What will happen to the bodies of the plane crash's 298 victims, many of which are being kept in refrigerated train cars? And who pulled the trigger to bring the plane down? Diplomatic rounds: U.S. Secretary of State John Kerry will be back in Jerusalem today as the United States tries to broker a cease-fire in Gaza between Israel and Hamas. U.N. Secretary-General Ban Ki-moon is also supposed to be in town. More than 570 Palestinians have been killed during Israel's incursion, according to Gaza's Health Ministry. Israel Defense Forces said 27 Israeli soldiers have died in the fighting. Two civilians have died in rocket attacks. Identification made: DNA taken from a body last month in a plum field matches that of a fugitive billionaire wanted for questioning in a ferry sinking, police in South Korea said today. Yoo Byung-eun went missing after the ferry sank in April, killing 292 people. Through an investment mechanism and subsidiary, Yoo, 73, and his two sons were believed to have controlled the shipping company that operated the ferry. Authorities wanted to question him about alleged funds embezzlement, tax evasion and other irregularities. To the border: Gov. Rick Perry will immediately send up to 1,000 National Guard troops to help secure the Texas border with Mexico. Perry also wants the White House and Congress to hire an additional 3,000 border patrol agents to eventually replace them. Tens of thousands of unaccompanied minors from Central America have crossed into the United States this year, creating a humanitarian crisis. The price tag is about $12 million per month to deploy the National Guard. Four-day weekend: Mexican billionaire Carlos Slim thinks this might work. He's suggesting three-day work weeks. Sounds good, right? There's a catch. It would require 11-hour work days and workers to stay on the job until age 70 or 75. "With three work days a week, we would have more time to relax; for quality of life," Slim said. Maybe so, but who's going to have enough money for all that leisure time? –Harvey the rescue cat: This special four-legged friend was born with a rare condition. He has no bones in his front legs. It's earned him the nickname "kangaroo cat," because he often hops around on his hind legs. - Walk like Mama: This toddler brings down the house by imitating his mom, who was eight months pregnant at the time. Cute, but at Mom's expense. - Wow: A film student makes a dazzling animated short, using mostly paper. Well done, sir. - Grandpa rocks: This elderly gentleman ditches his canes to bust a move. - Duck crossing: Russian motorists stop traffic to help a family of ducks safely cross a busy road.